Generally, the Cattauragus is an exceptional choice during a low water fall, however high temps have kept it a bit too warm for runs to occur. Ongoing excavation on the reservation related to "erosion control" has turned the lower end of the river into a chalky, muddy mess. The lower end of the Catt is where activity starts, so as soon as the digging ends, one can expect at least decent fishing. The key is to keep an eye on the evening temps in Springville, as they will determine run timing more than any other factor. Every year, fish show up at Scoby Hill Dam much earlier than conditions would appear to warrant. For now, this is just something to keep an eye on, as not much has happened yet. The dam controlled tributaries of the Lake Ontario shoreline are better option, where salmon and brown trout activity has already begun. Salmon bring steelhead and lake run brown trout "along for the ride," as they follow the egg hatch. Often, this feast supersedes the wait for more conducive stream conditions, so runs can occur despite warm, clear water. Early king salmon are fantastic biters when fresh runs occur, and now is the time to intercept them on their way in. Crowded conditions on the streams during salmon season are always the norm, but it is early and many wait until the fish are in heavy and are visible on spawning beds. Now is when you can actually fish for salmon to catch them; while they are still eating and not spawning. There are other venues in New York that get very little attention and are great early season alternatives. The mighty Niagara is a twelve month a year fishery that knows nothing of low water, and a variety of fish are always present. It is also devoid of crowds and features plenty of public access. Way up north, past the crowds of the Salmon River, the Black River is a forgotten option that gets very early runs of fish. The Oswego River is one of my favorites of all time, and is a spey rod angler's dream. Never mind the crowds at the dam face, there is an entire eighth mile wide river that nobody fishes downstream for a mile to the lake. Somehow, anglers there seem to all have forgotten that every king, brown, and steelhead that makes it to the dam face had to first swim through the river below. Braids, pits, channels, and every imaginable type of structure exist in the runs below the dam, and all can be fished via swing or indy. Few tributaries on all of the Great Lakes have enough water to warrant a fourteen foot nine weight spey rod, and I just mentioned two. Any river with a dam on it is a reasonable alternative to a warm, dry fall, and that is not limited to lake run fisheries. The Allegheny, Youghiogheny, and Clarion all come to mind for extending trout season. All of the Pennsylvania spring creeks do as well. Prespawn browns are aggressive and feed heavily on caddis and blue winged olives. Rainbows go nuts over eggs from early spawning browns. Streamer fishing is at its peak during this period. Brown trout fishing peaks just before spawn time, and soon it will be time to leave those fish alone to procreate. Even though fall trout fishing is often overshadowed by our tributary game, it still represents some of the best trout fishing of the year. Fall binge is an expression very familiar to warmwater guys, and on the Allegheny the Muskies are no exception as they fatten up before winter. Regardless of their choice of venue, savy anglers adjust expectations in order to retain their sanity through a warm, dry Fall. 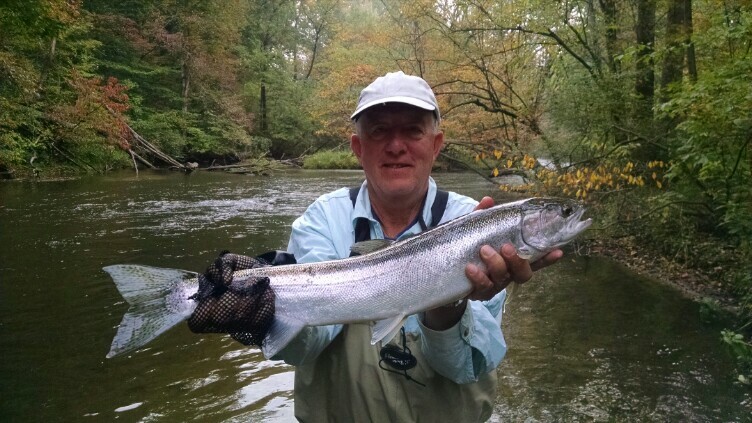 Despite good water here in Michigan, salmon activity is off to a slow, gradual start. With the run only beginning, lake run brown and steelhead activity is as well behind. High temperatures and sunny days don't bode well for those who rise late, so getting out at or near daybreak is required for success. On overcast days, fishing stays better longer, but only if the temperature doesn't rise excessively. Cold fronts and sprinkles, coupled with a steady low barometer make for the best conditions. Early season fishing is about "fish hunting" and is rarely about big numbers, no matter where you are. A drift boat, raft, or kayak is a,, serious weapon for covering water, and helps immensely when fish are sparse. Moving quickly through a section and making only a few drifts through holding lies helps wading anglers cover a lot of water quickly. Don't change your rig up too much. Fresh run fish are not picky. Stick with tried and proven patterns, move your indicator around, and adjust weight. Don't overthink the fishing just keep moving in search of fish. Fish early and late. Don't get discouraged if you can't find the few needles in the haystack. So where has the Jones crew been residing as of late? In Michigan, where water conditions are very stable as a rule. Here, rivers are governed by a high water table with massive amounts of spring influence statewide. This constitutes an optimal defense against warm/dry Fall weather patterns. Rains do trigger runs here like anywhere else, but great base flows and buffered river temperatures allow migratory fish a constant opportunity to run regardless of weather. Because of this, subtle changes are big triggers. A few nights ago the low temps dropped into the 40's, about a ten degree drop from the previous few days. Salmon beds appeared the next morning, where there had been no salmon present the day before, and the resident trout became more active.